7.1.1. What is a Move? 7.1.2. What is a MoveSelector? 7.7.1. Which move types might be missing in my implementation? If we ignore the 4 changeMove's that have not impact and are therefore not doable, we can see that number of moves is n * (n - 1) = 12. This is far less than the number of possible solutions, which is n ^ n = 256. As the problem scales out, the number of possible moves increases far less than the number of possible solutions. There are many other types of moves besides changeMove's. Many move types are included out-of-the-box, but you can also implement custom moves. A Move can affect multiple entities or even create/delete entities. But it must not change the problem facts. All optimization algorithms use Move's to transition from one solution to a neighbor solution. Therefor, all the optimization algorithms are confronted with Move selection: the craft of creating and iterating moves efficiently and the art of finding the most promising subset of random moves to evaluate first. A MoveSelector's main function is to create Iterator<Move> when needed. An optimization algorithm will iterate through a subset of those moves. Out of the box, this works and all properties of the changeMoveSelector are defaulted sensibly (unless that fails fast due to ambiguity). On the other hand, the configuration can be customized significantly for specific use cases. For example: you want want to configure a filter to discard pointless moves. To create a Move, we need to select 1 or more planning entities and/or planning values to move. 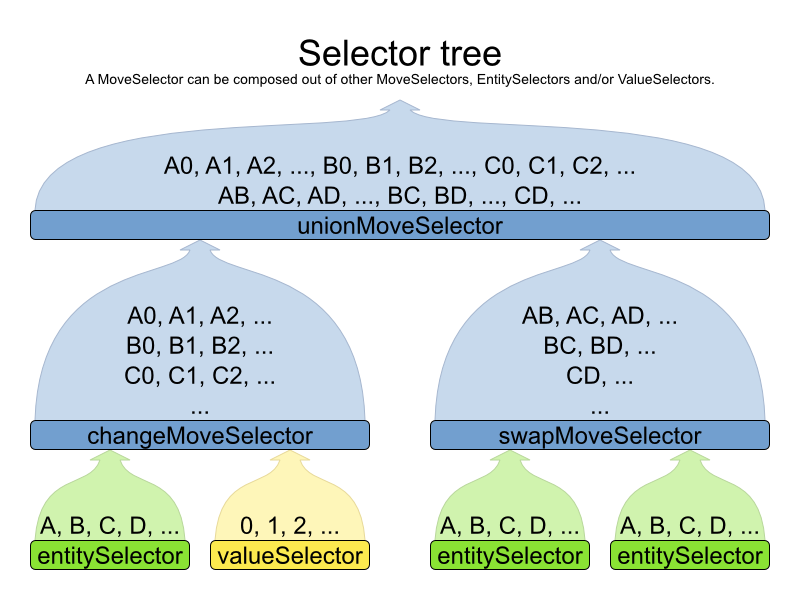 Just like MoveSelectors, EntitySelectors and ValueSelectors need to support a similar feature set (such as scalable just-in-time selection). Therefor, they implement a common interface Selector and they are configured similarly. The root of this tree is a MoveSelector which is injected into the optimization algorithm implementation to be (partially) iterated in every step. A Selector's cacheType determines when a selection (such as a Move, an entity, a value, ...) is created and how long it lives. JUST_IN_TIME (default): Not cached. Construct each selection (Move, ...) just before it's used. This scales up well in memory footprint. STEP: Cached. Create each selection (Move, ...) at the beginning of a step and cache them in a list for the remainder of the step. This scales up badly in memory footprint. PHASE: Cached. Create each selection (Move, ...) at the beginning of a SolverPhase and cache them in a list for the remainder of the SolverPhase. Some selections cannot be phase cached because the list changes every step. This scales up badly in memory footprint, but has a slight performance gain. SOLVER: Cached. Create each selection (Move, ...) at the beginning of a Solver and cache them in a list for the remainder of the Solver. Some selections cannot be solver cached because the list changes every step. This scales up badly in memory footprint, but has a slight performance gain. Nested selectors of a cached selector cannot be configured to be cached themselves, unless it's a higher cacheType. For example: a STEP cached unionMoveSelector can hold a PHASE cached changeMoveSelector, but not a STEP cached changeMoveSelector. A Selector's selectionOrder determines the order in which the selections (such as Moves, entities, values, ...) are iterated. An optimization algorithm will usually only iterate through a subset of its MoveSelector's selections, starting from the start, so the selectionOrder is critical to decide which Moves are actually evaluated. ORIGINAL: Select the selections (Moves, entities, values, ...) in default order. Each selection will be selected only once. SORTED: Select the selections (Moves, entities, values, ...) in sorted order. Each selection will be selected only once. Requires cacheType >= STEP. Mostly used on an entitySelector or valueSelector for construction heuristics. See sorted selection. RANDOM (default): Select the selections (Moves, entities, values, ...) in non-shuffled random order. A selection might be selected multiple times. This scales up well in performance because it does not require caching. SHUFFLED: Select the selections (Moves, entities, values, ...) in shuffled random order. Each selection will be selected only once. Requires cacheType >= STEP. This scales up badly in performance, not just because it requires caching, but also because a random number is generated for each element, even if it's not selected (which is the grand majority when scaling up). PROBABILISTIC: Select the selections (Moves, entities, values, ...) in random order, based on the selection probability of each element. A selection with a higher probability has a higher chance to be selected than elements with a lower probability. A selection might be selected multiple times. Requires cacheType >= STEP. Mostly used on an entitySelector or valueSelector. See probabilistic selection. A selectionOrder can be set on composite selectors too. When a Selector is cached, all of its nested Selectors will naturally default to selectionOrder ORIGINAL. Avoid overwriting the selectionOrder of those nested Selectors. Notice that it never creates a list of Moves and it generates random numbers only for Moves that are actually selected. This combination often wins for small and medium use cases (5000 entities or less). Beyond that size, it scales up badly in memory footprint and performance. Notice that each Move will only be selected once, even though they are selected in random order. This combination is often a worthy competitor for medium use cases, especially with fast stepping optimization algorithms (such as simulated annealing). 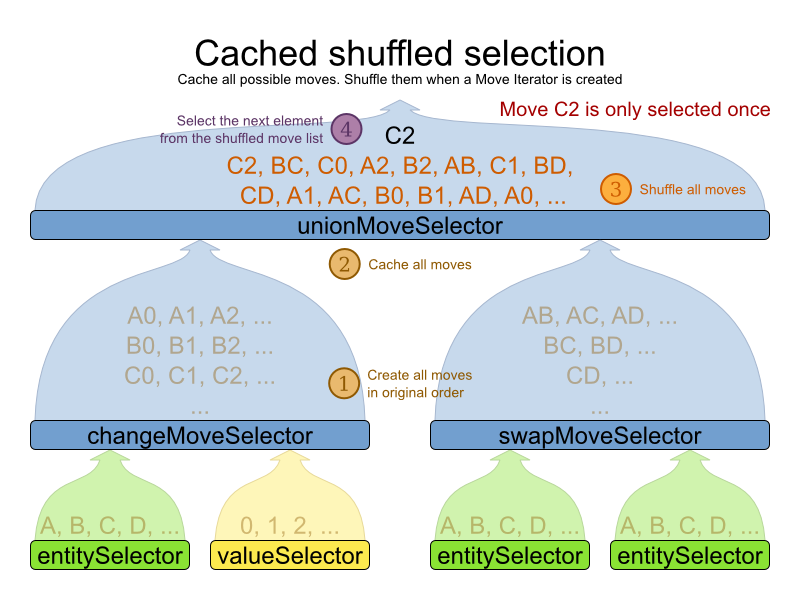 Unlike cached shuffled selection, it doesn't waste time shuffling the move list at the beginning of every step. The move is pointless and would only waste CPU time. For example, swapping 2 lectures of the same course will result in the same score and the same schedule because all lectures of 1 course are interchangeable (same teacher, same students, same topic). Doing the move would break a build-in hard constraint, so the solution would be infeasible but the score function doesn't check build-in hard constraints (for performance gain). For example, don't change a gym lecture to a room which is not a gym room. Note that any build-in hard constraint must usually be filtered on every move type. For example, don't swap the room of a gym lecture with another lecture if the other lecture's original room isn't a gym room. 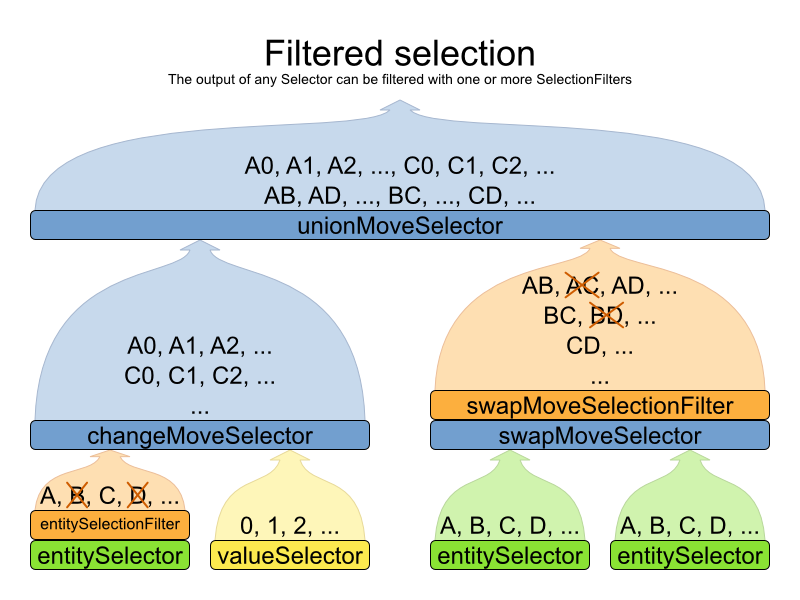 Filtered selection can happen on any Selector in the selector tree, including any MoveSelector, EntitySelector or ValueSelector. It works with any kind of cacheType and selectionOrder. Implement the method accept to return false on a discarded selection. Unaccepted moves will not be selected and will therefore never have their method doMove called. You can configure multiple filterClass elements on a single selector. Sorted selection can happen on any Selector in the selector tree, including any MoveSelector, EntitySelector or ValueSelector. It does not work with cacheType JUST_IN_TIME and it only works with selectionOrder SORTED. It's mostly used in construction heuristics. Probabilistic selection can happen on any Selector in the selector tree, including any MoveSelector, EntitySelector or ValueSelector. It does not work with cacheType JUST_IN_TIME and it only works with selectionOrder PROBABILISTIC. For example, if there are 3 entities: process A (probabilityWeight 2.0), process B (probabilityWeight 0.5) and process C (probabilityWeight 0.5), then process A will be selected 4 times more than B and C.
During mimic selection, 1 normal selector records its selection and 1 or multiple other special selectors replay that selection. The recording selector acts as a normal selector and supports all other configuration properties. A replaying selector mimics the recording selection and support no other configuration properties. Mimic selection is usefull to create a composite move from 2 moves that affect the same entity. For 1 planning variable, the ChangeMove selects 1 planning entity and 1 planning value and assigns the entity's variable to that value. A ChangeMove is the finest grained move. Almost every moveSelector configuration injected into a metaheuristic algorithm should include a changeMoveSelector or a custom implementation. This guarantees that every possible Solution can be reached through applying a number of moves in sequence (not taking score traps into account). Of course, normally it is unioned with other, more course grained move selectors. The SwapMove selects 2 different planning entities and swaps the planning values of all their planning variables. Although a SwapMove on a single variable is essentially just 2 ChangeMoves, it's often the winning step where the first of the 2 ChangeMoves would not be the winning step because it leave the solution in a state with broken hard constraints. For example: swapping the room of 2 lectures doesn't bring the solution in a intermediate state where both lectures are in the same room which breaks a hard constraint. The secondaryEntitySelector is rarely needed: if it is not specified, entities from the same entitySelector are swapped. If one or more variableNameInclude properties are specified, not all planning variables will be swapped, but only those specified. For example for course scheduling, specifying only variableNameInclude room will make it only swap room, not period. A pillar is a set of planning entities which have the same planning value(s) for each of their planning variables. The pillarSwapMove selects 2 different entity pillars and swaps the values of all their variables for all their entities. The secondaryPillarSelector is rarely needed: if it is not specified, entities from the same pillarSelector are swapped. The other properties are explained in swapMoveSelector. A subChain is a set of planning entities with a chained planning variable which form part of a chain. The subChainChangeMove selects a subChain and moves it to another place in a different or the same anchor chain. The subChainSelector selects a number of entities, no less than minimumSubChainSize (defaults to 2) and no more than maximumSubChainSize (defaults to infinity). The property selectReversingMoveToo (defaults to true) enabled selecting the reverse of every subchain too. The subChainSwapMove selects 2 different subChains and moves it to another place in a different or the same anchor chain. The secondarySubChainSelector is rarely needed: if it is not specified, entities from the same subChainSelector are swapped. 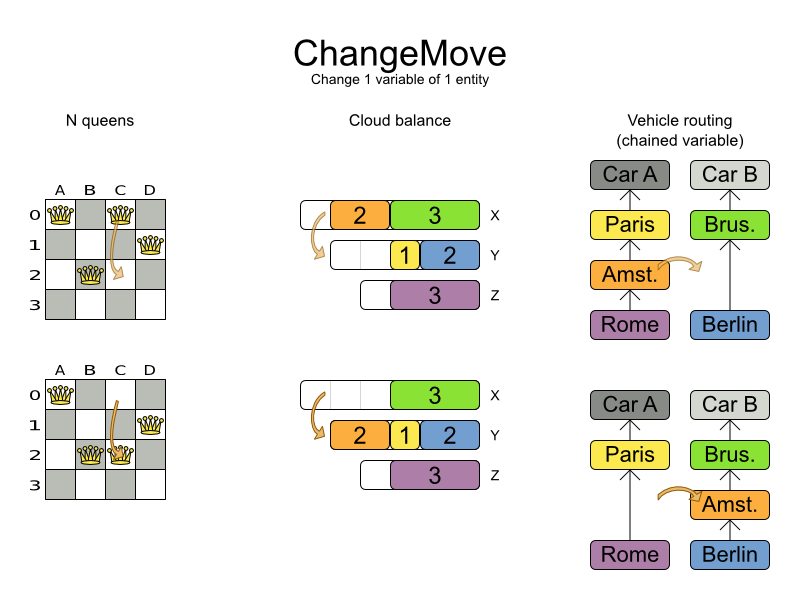 The other properties are explained in subChainChangeMoveSelector. 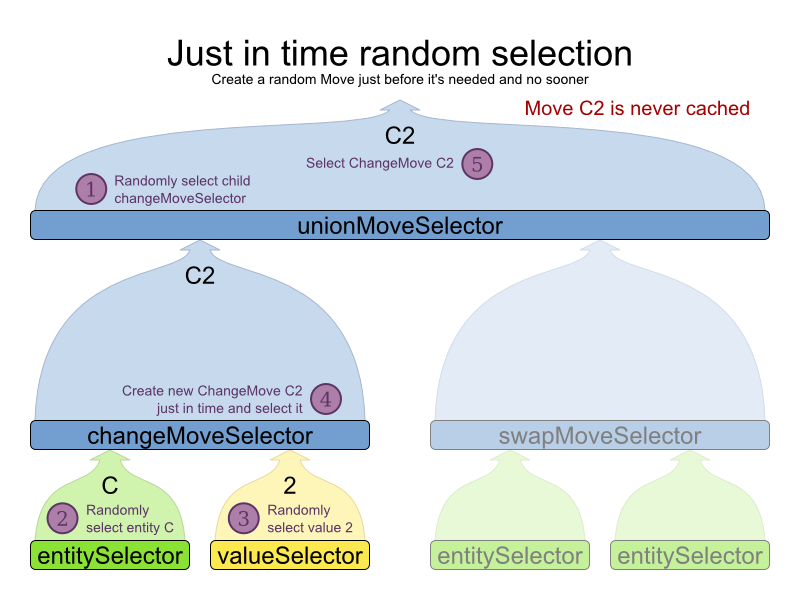 A unionMoveSelector selects a Move by selecting 1 of its child MoveSelectors to supply the next Move. A cartesianProductMoveSelector selects a new CompositeMove. It builds that CompositeMove by selecting 1 Move per child MoveSelector and adding it to the CompositeMove. The propery ignoreEmptyChildIterators (true by default) will ignore every empty childMoveSelector to avoid returning no moves. For example: a cartesian product of changeMoveSelector A and B, for which B is empty (because all it's entities are immovable) returns no moves if ignoreEmptyChildIterators is false and the moves of A if ignoreEmptyChildIterators is true. The entityClass property is only required if it cannot be deduced automatically because there are multiple entity classes. The variableName property is only required if it cannot be deduced automatically because there are multiple variables (for the related entity class). To determine which move types might be missing in your implementation, run a benchmarker for a short amount of time and configure it to write the best solutions to disk. Take a look at such a best solution: it will likely be a local optima. Try to figure out if there's a move that could get out of that local optima faster. If you find one, implement that course-grained move, mix it with the existing moves and benchmark it against the previous configurations to see if you want to keep it. Instead of reusing the generic Moves (such as ChangeMove) you can also implement your own Moves. Generic and custom MoveSelectors can be combined as wanted. A custom Move can be tailored to work to the advantage of your constraints. For example, in examination scheduling, changing the period of an exam A also changes te period of all the exams that need to coincide with exam A. A custom Move is also slightly faster than a generic Move. However, it's far more work to implement and much harder to avoid bugs. After implementing a custom Move, make sure to turn on environmentMode FULL_ASSERT to check for score corruptions. An instance of RowChangeMove moves a queen from its current row to a different row. You need to call the methods scoreDirector.beforeVariableChanged(Object, String) and scoreDirector.afterVariableChanged(Object, String) directly before and after modifying the entity. You can alter multiple entities in a single move and effectively create a big move (also known as a coarse-grained move). A Move can only change/add/remove planning entities, it must not change any of the problem facts. A move that changes nothing on the current solution. For example, moving queen B0 to row 0 is not doable, because it is already there. A move that is impossible to do on the current solution. 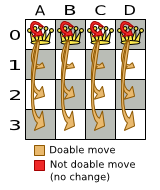 For example, moving queen B0 to row 10 is not doable because it would move it outside the board limits. Because we won't generate a move which can move a queen outside the board limits, we don't need to check it. A move that is currently not doable could become doable on the working Solution of a later step. Each move has an undo move: a move (normally of the same type) which does the exact opposite. In the example above the undo move of C0 to C2 would be the move C2 to C0. An undo move is created from a Move, before the Move has been done on the current solution. Notice that if C0 would have already been moved to C2, the undo move would create the move C2 to C2, instead of the move C2 to C0. A solver phase might do and undo the same Move more than once. In fact, many solver phases will iteratively do an undo a number of moves to evaluate them, before selecting one of those and doing that move again (without undoing it this time). A Move must implement the getPlanningEntities() and getPlanningValues() methods. They are used by entity tabu and value tabu respectively. When they are called, the Move has already been done. If your Move changes multiple planning entities, return all of them in getPlanningEntities() and return all their values (to which they are changing) in getPlanningValues(). A Move must implement the equals() and hashCode() methods. 2 moves which make the same change on a solution, should be equal. Notice that it checks if the other move is an instance of the same move type. This instanceof check is important because a move will be compared to a move with another move type if you're using more then 1 move type. Now that we can implement a single custom Move, let's take a look at generating such custom moves. Because the MoveListFactory generates all moves at once in a List<Move>, it does not support cacheType JUST_IN_TIME. Therefore, moveListFactory uses cacheType STEP by default and it scales badly in memory footprint. The method getSize() must give an estimation of the size. It doesn't need to be correct. The method createOriginalMoveIterator is called if the selectionOrder is ORIGINAL or if it is cached. The method createRandomMoveIterator is called for selectionOrder RANDOM combined with cacheType JUST_IN_TIME. Don't create a collection (list, array, map, set) of Moves when creating the Iterator<Move>: the whole purpose of MoveIteratorFactory over MoveListFactory is giving you the ability to create a Move just in time in the Iterator's method next().